My patriotism is part family history, part intellectual conviction. As far as I can tell, my father’s and mother’s ancestors all came to this land prior to the Revolution, settling in the mid-Atlantic and Southern colonies, respectively. At least one ancestor fought in the War for Independence. If my family has a country, it has been America for a very long time. More than genealogy, however, this nation’s ideals explain my love for it. Our nation, as Abraham Lincoln so memorably put it, was “conceived in liberty and dedicated to the proposition that all men are created equal.” That is why I read the Declaration of Independence every Fourth—to remind myself of the American creed. It is a good creed. Who, after all, could possibly be for slavery and inequality? As a nation, we have not always lived up to those ideals, but the answer to our hypocrisy is to reform our behavior, not necessarily to reformulate our deepest beliefs. Given my patriotism, it may surprise you to learn that the only Sunday morning worship service I have ever walked out of in sorrow was a patriotic worship service. The service was conducted with sincerity and excellence. It was a highlight of the year for many of the other church attendees. Members of the community who would not otherwise darken the church’s doorstep came because of this service. And yet, I walked out, wondering whether my fellow Christians and I had worshiped country instead of God that day. We had celebrated America, saluted the flat, sung patriotic hymns, and honored the Divine Being whom the Declaration names as “Nature’s God” and “Creator.” We had not talked about “the God and Father of our Lord Jesus Christ” (1 Peter 1:3), however—who judges sin, offers salvation, and calls on people to repent and believe. We had heard, in short, the American creed but not the Christian gospel. That troubled me deeply. For while I love my country, I love Jesus more. I know that the American Way is not the Way, the Truth, and the Life. Our country is not God’s kingdom, our Declaration is not the Bible, our flag is not Christ’s cross, and Washington DC is not the New Jerusalem. (Thank God!) Worship services that blur the self-evident differences between the goodness of America and the grace of God neither honor God nor help sinners. Humanity’s deepest problem, after all, is not “taxation without representation,” but “all have sinned and fall short of the glory of God” (Rom. 3:23). Therefore, the solution most needed is not a declaration of independence but a confession of utter dependence on the mercy of the Savior (Eph. 2:8–9). If a worship service fails to include the proclamation of the gospel and an invitation to repentance and faith, then whatever else it has done, it has not worshiped God “in spirit and in truth” (John 4:24). This does not mean that the American creed and the Christian gospel necessarily contradict one another. It does mean that they exist in tension, however. Let me explain why with reference to the opening chapters of Genesis. So, yes, the American creed is good, true, and beautiful. But, no, it too has been distorted by the world, the flesh, and the devil. America can be loved, then, but not without critique and not without remainder. Love of country must be subordinated to a higher ideal. When displaying the American flag, etiquette demands that it be placed higher and more prominently than any other national flag. For the Christian, however, even the flag must bow to the Cross—and I’m not just talking about platform displays. I’m talking about the space the Cross occupies in our heads, hearts, and hands. The gospel of Jesus Christ—and the gospel alone—shines with undiminished spiritual and moral luminosity. (There is not “Yes, but…” when it comes to the gospel.) It is the standard against which all other allegiances, beliefs, and commitments must be judged. 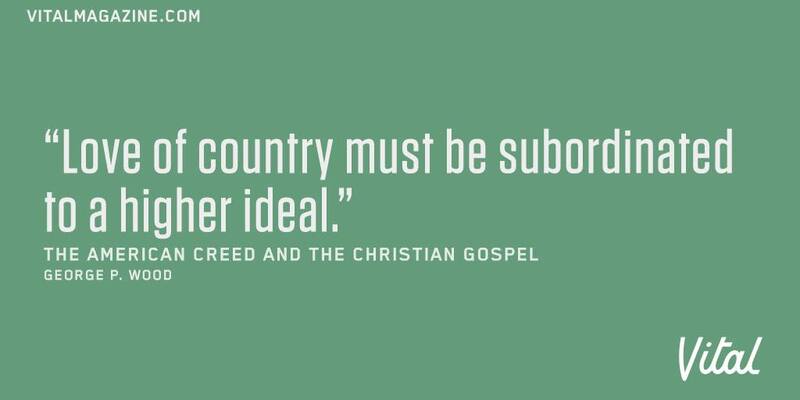 To the extent that the American creed conforms to gospel priorities, it can be affirmed. To the extent that in contradicts gospel priorities, it must be critiqued. In times past, American Christians have not always been aware of the extent to which American values contradict the gospel. One thinks especially—and with great sorrow—of white evangelical Christians’ weak support for if not outright opposition to the Civil Rights Movement of the mid-twentieth century. By contrast, one marvels at how Martin Luther King Jr. and other black ministers were able to touch what Lincoln called “the mystic chords of memory” and to awaken “the better angels of our nature” through explicit appeals to the gospel and the highest ideals of the American creed. The gospel demands not that we choose either flag or Cross, but that we subordinate the former to the latter—always and in every way. By doing so, the spiritual and moral purity of the gospel acts as an antidote on our sin-infected love of God’s good creation, including our sin-infected nation. Richard John Neuhaus often said, “Politics is chiefly a function of culture, at the heart of culture is morality, and at the heart of morality is religion.” For a long time, American Christians have thought of their country as a Christian nation. Whether that was the case historically is arguable. What is not arguable is that it is no longer the case today. To a significant extent, our politics and culture do not reflect the Christian religion. The temptation that must be avoided is to focus on changing our politics and culture without changing our religious commitments. Doing so puts “works” before “faith” and muddies the message of God’s grace. If Christians want to see true, lasting change in America, the place to begin seeking it is the altar rail, not the voting booth. This doesn’t mean the voting booth—or, increasingly, the judge’s bench—is unimportant. Voting for candidates, supporting legislation, advocating for specific causes are important, but not all important or even of the utmost importance. Government can enforce outward conformity to the law, after all; it cannot generate inward commitment to the highest moral ideals. The heart of the matter, from a political and cultural perspective, is the human heart, and only God can change it. Thus, our houses of worship should be places where the gospel—and it alone—is continually preached. As E. E. Hewitt’s wonderful hymn puts it, “Sing the wondrous love of Jesus, / Sing His mercy and His grace.” Keep the focus on Him as the solution to humanity’s pressing need. Ask people to come to faith in Him right then and there. Invite them to receive the Holy Spirit into their lives as God’s sanctifying and empowering Presence. Moreover, the local church should be the place where the gospel is first lived out socially. This is not only because Jesus Christ established a church, not a state, but also because Christians have no business telling others how to live if we are not living that way ourselves. “You hypocrite,” Jesus said to us; “first take the plank out of your own eye, and then you will see clearly to remove the speck from your brother’s eye” (Matt. 7:6). A gospel-centered integrity is beautiful and attracts others. I urge, then, first of all, that petitions and prayers, intercession and thanksgiving be made for all people—for kings and all those in authority, that we may live peaceful and quiet lives in all godliness and holiness. This is good and pleases God our Savior, who wants all people to be saved and to come to a knowledge of the truth (1 Tim. 2:1–4). This Fourth of July, may God grant our nation peace and quiet, godliness and holiness, through His Son, the Savior and Lord, Jesus Christ! Bravo, George! Well stated! Our challenge, as always, is to submit all claims of allegiance to the cross.